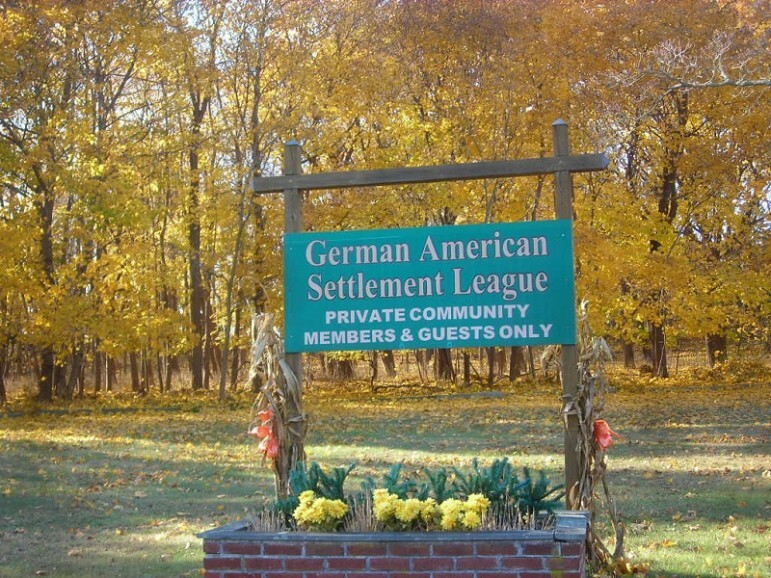 Yaphank is a hamlet (an unincorporated community) on New York’s Long Island with a Nazi past; in the 1930s, a large number of people of German heritage, many of whom were members of the German Bund movement, settled there. The vestiges of this history are largely gone, except for a requirement that homes in the community must be sold to persons “primarily of Germanic origin.” For nearly fifty years since the passage of the Federal Fair Housing Act, this restriction has prevented homeowners in the village from selling their homes on the open market. According to a New York Times story, “Nazi Past of Long Island Hamlet Persists in a Rule for Home Buyers,” a couple which own a house in Yaphank want to sell without abiding by the restrictions. The family wanted to sell their home. But the league’s covenants kept residents from advertising their homes on the open market. Even a for-sale sign was banned. Only members of the league, along with their friends, are told. The consequence: A white neighborhood that stays that way. Lexis Nexis explains: “A restrictive covenant requires the covenantor not to do the thing specified, whether that is building on or using the land for particular purposes. Unlike ‘positive’ covenants, the burden of a restrictive covenant is capable of ‘running with the land’, so that successive owners or occupiers are bound by the restriction.” Restrictions like this that were based on race or national origins were common enough in the United States that they were explicitly included as prohibited activities in the Federal Fair Housing Act. The Fair Housing Center of Greater Boston traces some of the history of restrictive covenants that flowed from a 1926 Supreme Court decision. Despite years of enforcement efforts, restrictive covenants persist. Ten years ago, the New York Times ran a different story on restrictive covenants in real estate. “Such clauses have been unenforceable for nearly 60 years. But historians who track such things say that thousands of racist deed restrictions, as well as restrictive covenants governing homeowner associations, survive in communities across the country.” In the case of Yaphank, it seems likely that the prohibition on advertising and using real estate professionals permitted Yaphank’s restriction to survive for so long. Most of these clauses were struck down in the 1970s, as real estate agents and private attorneys, who are obligated to comply with the Fair Housing Act, advised sellers that their deed restrictions were in violation of the law. Even where real estate agents looked the other way, private nonprofit Fair Housing Agencies, like Long Island Housing Services were increasingly vigilant about deed restricted sales. With funding from the HUD Fair Housing Initiatives Program (FHIP), private fair housing agencies complement the enforcement duties of state and local governments. Most often, private fair housing agencies have the time and expertise to investigate housing cases that might be more complex than a simple “denial” of housing, and they can provide education and counseling to potential complainants. Because private fair housing agencies have standing to file a case, they can bring a charge against a fair housing violator in either state or Federal Court. In practice, these agencies often act in cooperation with public agencies when litigation is required. Is Yaphank an artifact or a relic? An artifact is something left behind from a past civilization that may not have much relevance today. A relic, on the other hand, tells us something about who we are as a people. The residents of Yaphank seem like they would like to forget their past. But in the 2005 New York Times article on restrictive covenants, a victim comments on the need to preserve this history. “Once the clauses are removed, it is important to keep a historic record of them,” said Sandra Stites, an obstetrician who lives in a Kansas City house governed by covenants containing racist language. “We know this horrific history existed, and it should never have happened and it should never happen again,” she said. Dr. Stites, who is African-American, said she wants her three children to understand their country’s past. “If we’re not aware that this did happen, we could go backwards,” she said. Thanks to Joyce Hill for sharing her insights on this issue. When members of POTUS’ business advisory councils started to leave one after another, complete with statements of political disavowal after Charlottesville, Trump decided to trump them by “disbanding” the councils altogether. Except one may have disbanded itself.